My painting for the Wilderness Art Challenge, posted by Gary Keimig. Most interested in the pattern of hair growth on this big guy, different than other animals. Check out the others on Gary's blog! Oh thank you Cheyenne, I am going to go look (And put off my chores a little while longer! Wonderful job, Maria....I know for a fact this was not an easy one to paint. You did wonderful! Thank you Carol, it was a bit of a challenge, but what a great photo, can't imagine being that close to the bear and being able to get the picture taken! What a happy-looking bear! And i love the background colors you have used. Wow Maria, this is gorgeous! Thanks for sending this Maria. Just got it posted and apologize for being so late in doing so. Have been out of town and just getting caught up on business. Thanks Gary, for sharing your great photos, it is a treat to paint from these! Look forward to seeing all the paintings from this one. That is lovely! 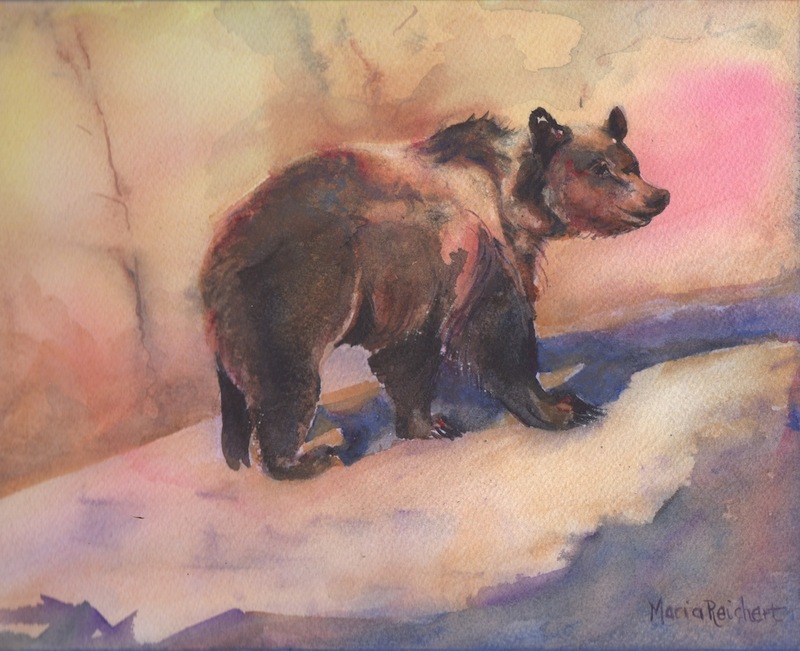 I really like the use of soft pinks and oranges in the background to balance your bear. Wonderful.